Well, the Matthew Dellavedova era was fun, but it’s all over now. Stephen Curry put an end to all that on Sunday night around 10:30 p.m. EST by meticulously picking apart Delly in the fourth quarter of Game 5 of the NBA Finals. The Golden State Warriors were reportedly “pissed off” about all the media hype surrounding Delly, a no-name point guard who had stolen the basketball world’s collective heart during the finals with his scrappy play and penchant for falling on the floor. So it’s hard not to believe the league’s MVP took some joy in humiliating the Australian over and over again on Sunday night. 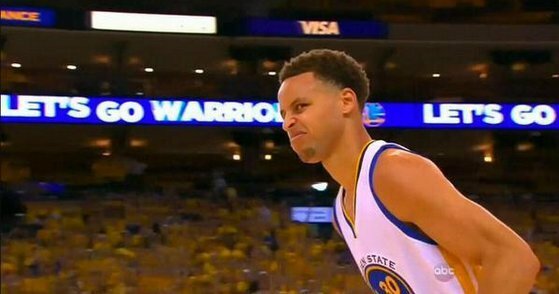 Curry made a face after one of those shots, and it really said more than anything that could possibly have come out of his mouth. Curry ended the night with 37 points on seven threes, along with an eye-popping +24 plus-minus for the night. Delly had five points and a -19 on the plus-minus scale. Oh, and the Warriors won 104-91. The Delly is over, and Stephen Curry is back.